The major objective of our research is to understand the factors that lead to diabetic retinopathy (DR) and retinopathy of prematurity (ROP) in order to develop new treatment targets. Our research is conducted in animal models of retinopathy to ultimately translate our findings to patient studies. 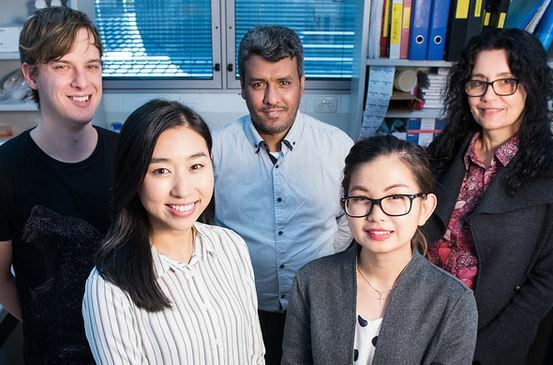 Our established network of basic scientists as well as clinical researchers and ophthalmologists (see below), allows this research to move rapidly forward and is enhanced by the new facilities and resources available in the Department of Diabetes. 2017 group, L-R: Mr Jack Jerome, Ms Osanna Wong, Mr Saeed Alrashdi, Dr Devy Deliyanti, Professor Jenny Wilkinson-Berka. Our research is focussed on two diseases that are major causes of vision loss throughout the world – diabetic retinopathy (DR) in adults and retinopathy of prematurity (ROP) in children. Both diseases compromise the integrity of blood vessels within the retina and involve injury to neurons and glial cells that form the neurovascular unit. Professor Jennifer Wilkinson-Berka is a world authority on pre-clinical studies of DR and ROP and has published over 100 manuscripts in the field. Images of retina from non-diabetic and diabetic animals. Retinal tissue has been removed to show only capillaries. The arrow denotes an acellular capillary in diabetes. Vision loss in DR develops slowly over approximately 20 years of raised blood glucose levels such that about 10% of patients experience vision-threatening diabetic macular oedema (DME) due to vascular leakage from a compromised blood-retinal barrier, and a similar proportion proliferative DR due to pathological angiogenesis (neovascularization). Unfortunately, the prevalence of DR is escalating, yet few treatments are available. Agents administered into the eye to inhibit the potent vascular permeability and angiogenic factor, vascular endothelial growth factor (VEGF) revolutionized the treatment of DME and proliferative DR. However, 35-65% of these patients continue to have some degree of persistent DME that can result in irreversible functional damage. Moreover, there are no treatments that prevent the progression of DR to DME and proliferative DR. Hence, there is an unmet and urgent medical need to identify new treatments to improve the outlook of DR.
ROP is a vasoproliferative disorder of the retina and the main cause of blindness in neonates and young children. The risk factors for ROP include low birth weight and low gestational age as well as supplemental oxygen therapy administered to assist the breathing of infants born prematurely. The “first epidemic” of ROP occurred in the 1940’s in the USA, Australasia and Western Europe, due to the use of unmonitored supplemental oxygen in closed incubators to assist with the survival of preterm infants. In subsequent years it was identified that restricting oxygen supplementation reduced blindness from ROP, but there was also an increased rate of mortality and cerebral palsy in premature babies. The “second epidemic” of ROP occurred in the 1970’s in Westernized countries due to advances in neonatal care resulting in the survival of younger and extremely low gestational age babies (<28 weeks at birth). Advances in screening and surgical treatment greatly improved outcomes for these children with ROP. However, in the last decade or more, a “third epidemic” of ROP has occurred that is principally due to the rise in preterm births in low to middle income countries as well as inadequate neonatal care in these environments. Today, it is estimated that the overall incidence rate of ROP is about 68% among infants born less than 1251g and 98% among infants born with birth weight less than 750g. Unfortunately, ROP results in lifelong disability such as compromised visual acuity, colour discrimination, and binocular vision, with severe consequences for education and employment. ROP occurs in two phases. In phase 1, exposure of the infant to supplemental oxygen causes retinal vaso-obliteration (Figures below). With maturation of the infant and increasing metabolism of the retina, the non-vascularized retina becomes increasingly ischemic which stimulates retinal neovascularization via the up-regulation of VEGF and other angiogenic factors. This characterizes phase 2 and is comprised of 5 clinical stages, based on the extent of retinal neovascularization and retinal detachment. Recently it has been demonstrated that during phase 2 of ROP, the retinal pigment epithelium (RPE), which overlies the vascular choroid, becomes damaged and the choroid begins to involute. This pathology continues into at least young adulthood and can result in defective dark adaptation and anomalies in colour discrimination. (A) Diagram showing vaso-obliteration and neovascularization in the inner retina. (B) Three μm sections of the outer retina from mice with OIR showing involution of the choroid and thinning of the retinal pigment epithelium (RPE). Retinas from mice that have been flat mounted and labelled with isolectin to show blood vessels in green. (A) Normal retina. (B) A retina from a mouse with OIR showing vaso-obliteration (asterisks) and neovascularization (arrows). We have available a variety of Honours and PhD projects. These projects are conducted in both animal models of retinopathy and sera and aqueous fluid obtained from patients. A variety of techniques are employed and include flow cytometry, confocal microscopy, immunohistochemistry, western blotting, ELISA, primary cultures of retinal cells, quantitative real-time PCR and RNASequencing. Utilising anticalin technology to develop new and effective treatments for diabetic retinopathy. Can boosting Foxp3+ T regulatory cells (Tregs) repair the damaged retinal vasculature in DR and ROP? Salt, the immune system and retinopathy. Lipoxins, a novel treatment to attenuate sight-threatening retinopathy in diabetes. Pieris Pharmaceuticals (Boston USA): Anticalin technology. 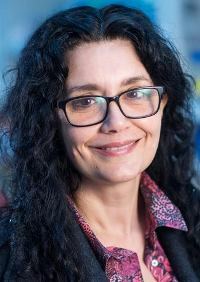 Professor Jennifer Wilkinson-Berka's Monash Researcher Profile. Our research success would not be possible without the valuable input from our collaborators in Australia and around the world.